*AdvaCare Vitamin Alpha D3 Premixes are GMP certified. **AdvaCare Vitamin Alpha D3 Premixes are manufactured in our facilities located in China, India and USA. AdvaCare is a GMP manufacturer of Vitamin Alpha D3 premixes. Vitamin alpha D3 premix is a dietary source for vitamin D, mainly used for poultry. Alpha D3 is 10 times more bioactive than the conventional sources of vitamin D3. It is considered the best source of vitamin D to maximize feed utilization efficiency and maintain bone and leg health. It maximizes feed utilization efficiency and helps to maintain bone and leg health. 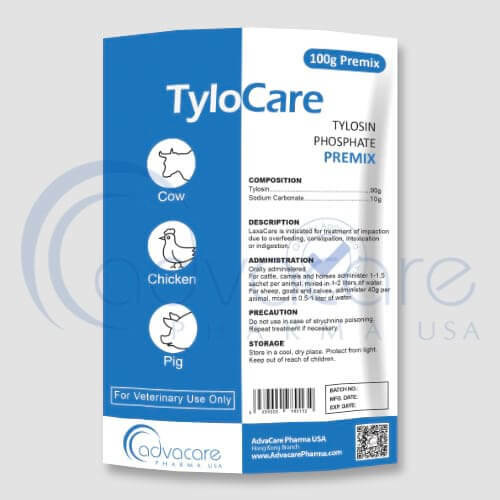 It helps to prevent tibia dyschondroplasia, improves calcium and phosphorous absorption, reduces cases of lameness, improves egg shell quality and reduces egg breakages. It helps in promoting healthy bones and helps in preventing tibia dyschondroplasia. No side effects have been detected yet, if you notice any serious effects or other effects not mentioned on the package, please inform your veterinary surgeon. 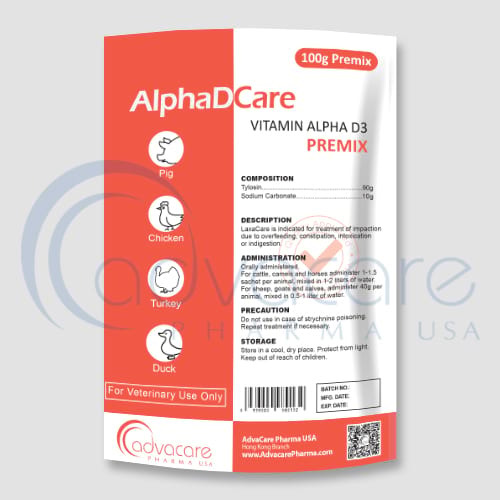 Always consult a veterinary physician or animal care specialist before using vitamin alpha d3 premix. If the condition does not improve or becomes worse, then call a veterinary physician or animal care specialist. Vitamin alpha D3 premix is not meant for human consumption. Usual dosage includes: 12.5g per ton of feed for poultry and broiler chicken. Do not exceed advised dosage, and complete the full treatment, as stopping early can result in a recurrence or worsen the problem. 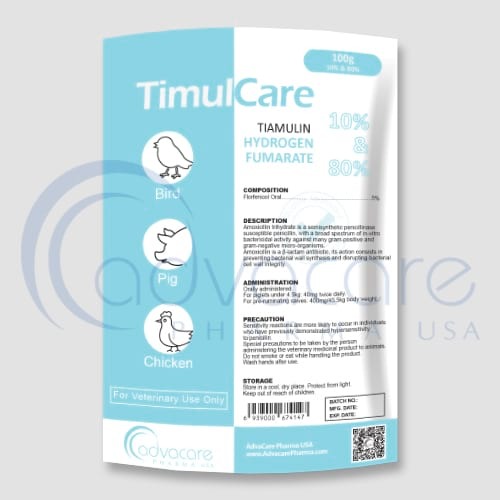 In the case of animals suffering from liver damage and impaired kidney; animals unable to absorb calcium which may lead to slow growth, rickets, poor mobility paralysis, convulsions in juvenile birds, thin shell and abnormal osteosarcoma. Consult with an animal care specialist about any other medications that are being taken by the animal, and their medical history, before their treatment with vitamin alpha D3 premix.